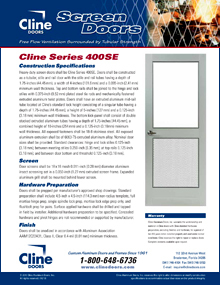 Cline's 400SE Series Screen Door is the ultimate in heavy-duty screen door applications. That is why Cline's Screen Door is the perfect choice for commercial kitchens, greenhouses, food processing plants, and commissaries. Measuring 1.75-inches in thickness, Cline's Screen Door is reinforced for many different types of commercial hardware. Separated by a 5-inch cross rail, the upper screen portion of the door features an aluminum insect screen. The bottom screen portion has the same insect screen, but also features an aluminum expanded metal grill mounted directly behind the screen.